From the bread makers of the 1990s to the George Foreman lean grill in the 2000s, we’ve always been enticed by fancy kitchen utensils and gadgets that promise to make our food as great as a Michelin starred chef. Even if our culinary skills aren’t quite up to world class standard (yet), it is undeniably true that we love filling our kitchens with latest technology. Part of the reason that we enjoy buying the best and most up-to-date kitchen electronics is the fact that everybody has to eat. And unless you live on a diet of take away and microwave food (time to stop that now!) or have your own personal chef, you will be using your kitchen to cook delicious home cooked meals. These fancy kitchen gadgets can make cooking more manageable and more fun, so check them out right here. Kitchen gizmos don’t always have to be super fancy, electrically powered and expensive; sometimes it’s the simplest things that are the most useful. 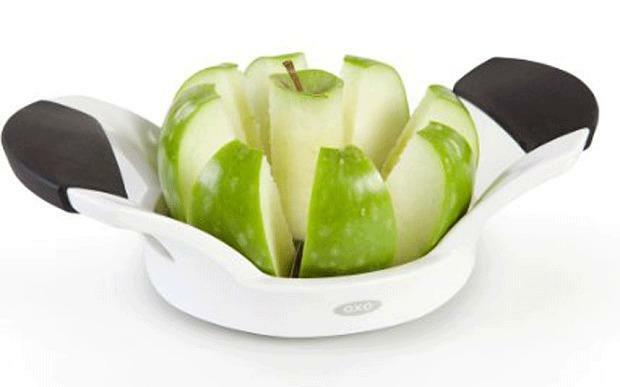 Take this easy to use apple divider and corer for example. With one smooth action it will divide your apple into 8 pieces, as well as removing the core without wasting most fruit. You may think that it is a bit decadent to indulge in this, but it only costs £6, and when you think how quick and easy it makes preparing a delicious and healthy snack, it is a great little piece for your kitchen. 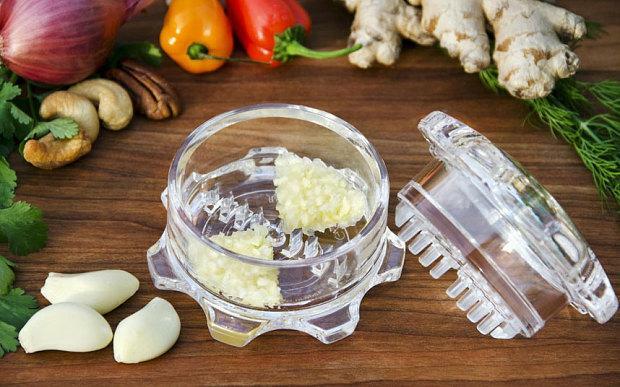 Are you fed up of trying to finely mince garlic cloves manually, or is it that you are fed up of washing those impossible to clean garlic crushers which make you lose half of the garlic in the process anyway? You may have attempted to be fancy, emulating the top celebrity chefs by crushing a clove deftly under a heavy knife, which is not as easy as it looks on TV by the way. Well those days are over; say hello to the Garlic Twist. This nifty little gadget is practically effortless to use, and with a few twists you can have perfectly minced garlic ready to be used. Even better this clear plastic device is easy to clean, to keep clean and to avoid leaving half of the clove behind. Priced at £15, this handy gadget which is another low-cost, simple yet brilliant one will make preparing one of the most popular cooking ingredients easy. For something a little bit more impressively hi-tech, and that is definitely in vogue at the moment thanks to its stylish design, is the KitchenAid. Available in various models, the most coveted one and just about the priciest is the KitchenAid Artisan Stand Mixer. With a plethora of attachments, this behemoth of a machine (it weighs over 10kg!) is great at mixing, whisking, kneading, whipping and more. With a price tag of over £500 its price is a bit steep, but view this as an investment for a great mixer that will stand the test of time, and which is incredibly versatile.